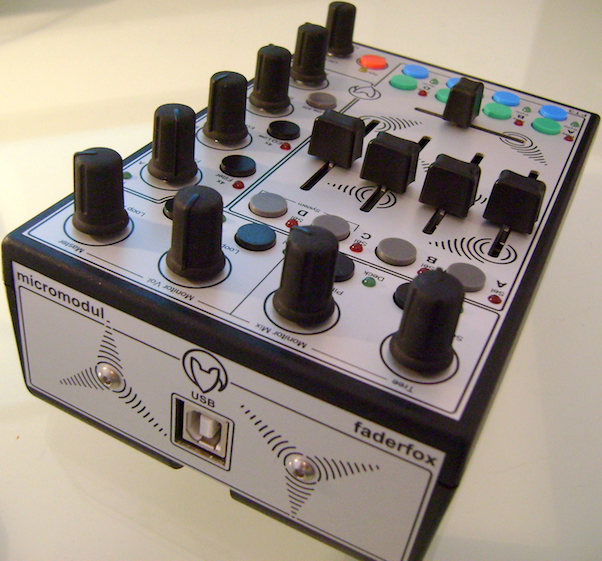 The Faderfox FT3 offers enhanced four-deck support for Traktor and also Ableton Live DJing, in a tiny unit. Last week we reviewed the Micromodul Faderfox DJ3 micro Midi controller for Traktor Pro. 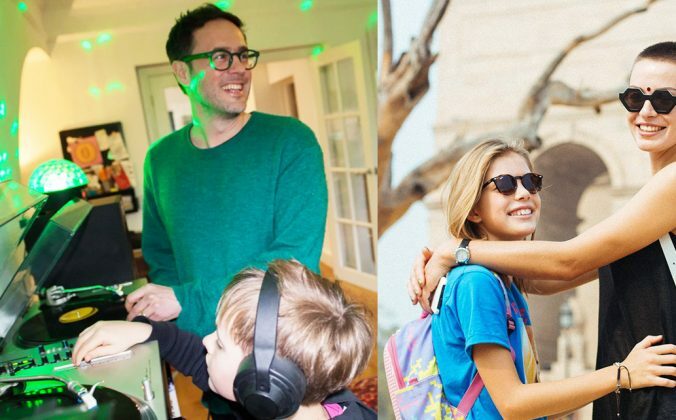 It is actually one of a family of four similar DJ controllers, and the other one of the four that we felt would be of particular interest to Digital DJ Tips readers is the Faderfox FT3, which we’re reviewing today. 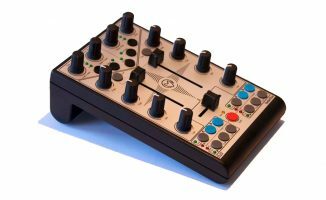 Just like the DJ3, this is a well made, compact DJ controller, with the same form factor as its sister unit, as well as the same overall concept: it’s a controller (not a sound interface, ie there’s no built-in audio circuitry – you’ll need to use a suitable DJ sound card with it), and it is designed for live, professional use, with high-quality faders and buttons. 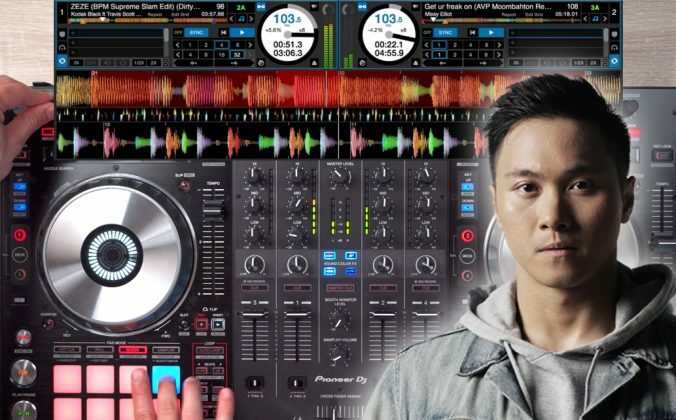 I’d recommend you visit the Faderfox DJ3 review and video if you haven’t already, as we’ve covered much of what the Faderfox FT3 is about there. Where this unit differs is in in the emphasis of the controls and the mappings. But first, the physical differences. Unlike the DJ3, this unit has four faders in addition to the crossfader – no need to switch. It loses one set of EQ controls, having only one vertical set of four knobs, down the right. These are now “infinity knobs” – they go round forever, which makes sense considering they have to be used across four decks. They also gain a “click” on pushing down. There are fewer transport buttons – eight in total at the bottom rather than the 12 of the DJ3, and each channel has a select button, making four in total, unlike the two cues of the DJ3. There is an extra knob bottom right which is used for track/scene selection. The Traktor mapping is perhaps even more ingenious than that of the DJ3. This controller is specifically designed for the DJ who performs with four decks and prefers lots of EQ and filtering. 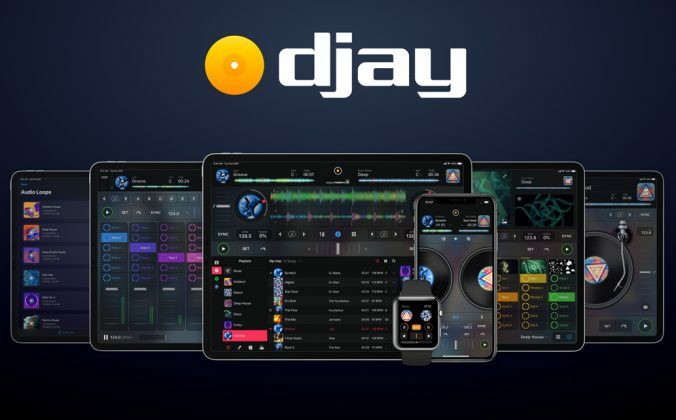 It would certainly suit you if you’re the type of DJ who meticulously beatgrids his tunes before a performance, as although there are phase nudge buttons, the standard transport controls are limited to play and sync. 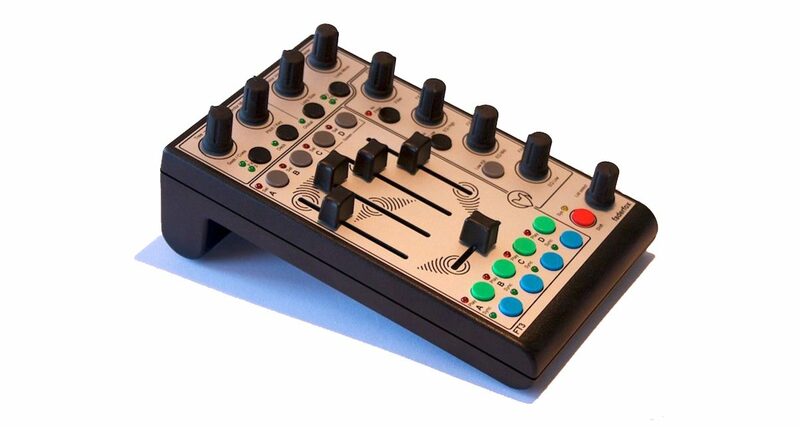 Remember that this is a Midi controller, not a sound interface – you’ll need a sound card too. It is still possible to set and manipulate cue points, though. 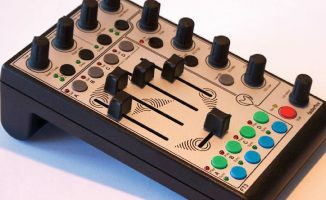 In fact, the top section of the controller broadly has the same functions as described for the DJ3 – there are effects, pitch/tempo adjust, looping, master levels and so on. The library functions have moved to the aforementioned bottom right knob. Remember too that everything is doubled up with the red “shift” button, and that knobs have push-to-click additional functionality. The cleverest part of the mapping is the extra modifiers given over to the four vertical knobs. By pressing “4x filter”, all of them turn into filters for all four decks. Yes, simultaneous filters are available for all four channels. Tap “4 x EQ low” and you get the same four-deck simultaneous functionality but for the bass EQs. As if that’s not enough bass EQ manipulation, you can use the low kill button to kill the bass on the selected deck instantly – and with “shift” pressed to, this becomes a high kill button. Another great EQ function is the push-to-reset. Pressing any of the four vertical knobs resets the EQ to flat on that deck. This is something you can’t do on analogue mixers, but which is a cinch on digital – if you’re mapped that way. 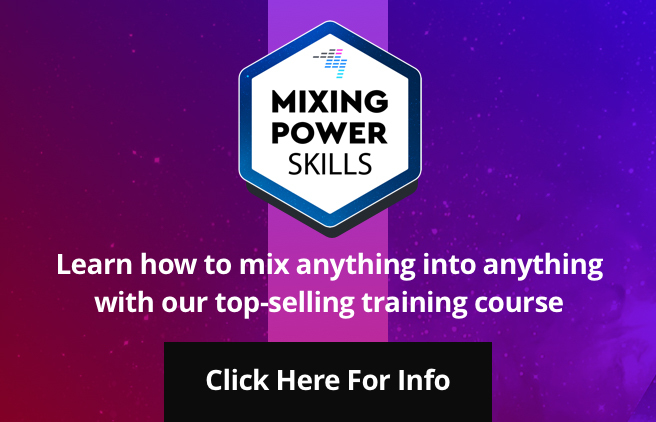 It’s great to max out the EQs creatively and then knock them back to normal simultaneously, and here you can do this across all decks at once if you want! 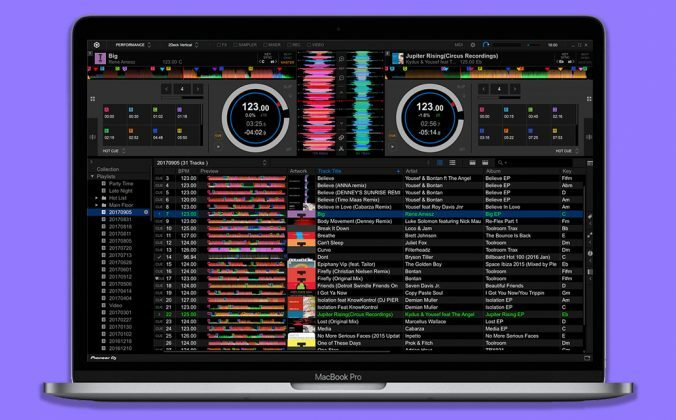 Most of the rest of the Traktor functionality is as the DJ3, so again, take a look at that review for more. Suffice to say you can control 95% of what you’ll need to in Traktor from this one diminutive surface. Set-up for Ableton Live is much as for Traktor – you load the template, assign the Midi-in and Midi-out ports and you’re off. The concept is broadly the same – the bottom right knob is used for scene selection, and you can launch, stop, mute, solo and control the volume of four clips simultaneously using the four faders. The select buttons above each fader select that clip so the EQs and filters etc can be assigned to it for further manipulation. Again there are 4 x filters and 4 x EQ modes available, and the top knobs and buttons are used for effects (this mapping assigns beat repeat, flanger, reverb, vinyl distortion and delay), plus clip gain, start/stop point editing, master tempo adjust, master/monitor volumes and metronome on / off. While this is plainly a mapping designed to give bona fide DJ-style control over Ableton Live to producer/DJs, the manufacturers have also wisely reflected that unlike a Traktor DJ, an Ableton DJ may well need to apply compression across the whole track, and the shift functions for the four knobs across the top address this, with all master compressor controls available across these four knobs. For Traktor Pro users who like to DJ across four decks with hands-on control over EQs, filters and kills, this is an incredible controller. Really, you can do stuff with this that you can’t do on many controllers of any size. For Ableton Live users, it offers a neat way to liberate much of the control from the mouse and keyboard so you can both sound a look a little more like a DJ. Many Ableton DJs use the Novation Nocturn for this purpose (maybe alongside a Launchpad) – the Nocturn is a similarly small controller, but the FT3 packs in far more flexibility and mapping that’s already been thought through for you. 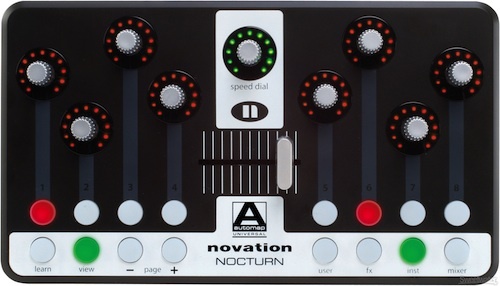 The Novation Nocturn is an alternative for micro control of Ableton (or, indeed, Traktor with the right mapping), but has fewer controls by far. 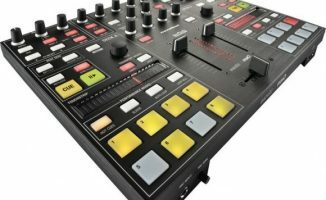 This is a specialised controller, more so than the DJ3, and as such is worth considering specifically if you’re a heavy four-deck user of Traktor, or an Ableton DJ looking for a capable compact DJ controller. 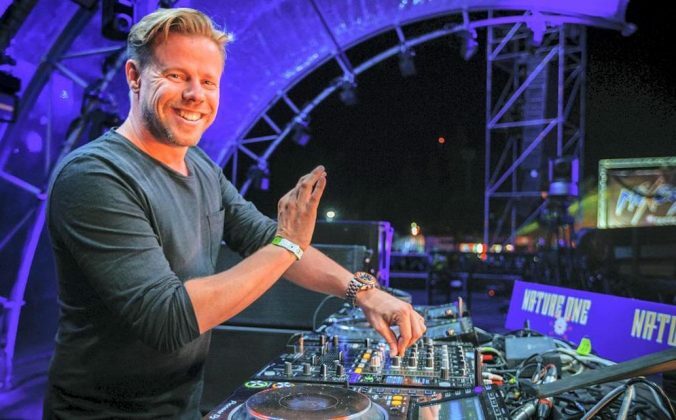 For general Traktor use, the DJ3 still has the edge, and if I were allowed to keep one of these for my own use, that would definitely be the one – but that’s because I DJ with two decks, only occasionally four, and I want something that approximates my preferred type of set-up. 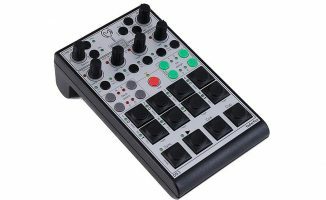 That’s the point, of course – of the four controllers in this range, the DJ3 was designed to closest replicate a more usual DJ workflow, this one is as described above, and the others (FX3, DL3 and DX3) are specifically for controlling loop, effects and using Traktor with an external mixer. Remember too that these are all remappable, and there’s no reason why you couldn’t mix and match them. So, back to the FT3. For any budding Ritchie Hawtin’s looking for pocket-sized Traktor control, or for Ableton Live DJs who want a compact controller to give tactile control over their Ableton Live DJ sets, the FL3 should definitely be on your shortlist. Have you been looking for a compact Ableton Live or Traktor Pro controller like this? Do you already use a Faderfox controller? What is your preferred micro-controller solution? Let us know in the comments.